Sportsmen everywhere are drawn to Myrtle Beach, South Carolina with its 60 mile strip of beautiful white sand beaches, fabulous championship golfing, and unparalleled fishing. Stay at our beautiful Barefoot Resort North Myrtle Beach, visit the many area attractions close by, take your pick of over 1,800 restaurants, and you have the ultimate sportsman’s Myrtle Beach vacation. Planning a charter trip is easy – we reccomend calling the Captains at Reel Action Fishing Charters. Not wanting the charter experience? Read the guides at MyrtleBeachFishing.org for an up-to-date guide on what’s biting and how to fish from the Cherry Grove Pier or from shore. 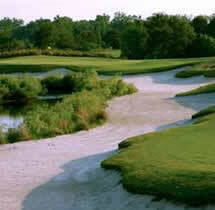 Playing on any of the well-manicured Myrtle Beach golf courses is a top activity among vacationers to the area. There are over 110 courses throughout the Grand Strand and Myrtle Beach area. Finding the best fairways for you during your Myrtle Beach vacation can be challenging, but involves very little travel once you get to the area as everything is near to Barefoot Resort North Myrtle Beach. North Myrtle Beach has some of the best courses in the region, such as our own Barefoot Resort’s Fazio course where you’ll find a lush setting among live oaks, pines, and tall grasses, with lots of intriguing sand traps to tax your golfing skills. Closer to the beach is Legends-Moorland, which one of the most challenging golf courses on the Eastern coast. With its sculpted terrain, stacks of natural growth, deep bunkers and plentiful water areas, you better bring your luck with you when you golf on this one. The Witch golf course is located among wetlands and forests, and golfers must traverse bridges to gain access to a fairway that is tight and requires precise shots, along with two island holes and some moderately difficult greens. This is one course that may leave you puzzled and you’ll want to come back for more. For those who are into world class salt water fishing, Myrtle Beach has plenty of different excursions for deep sea fishing. 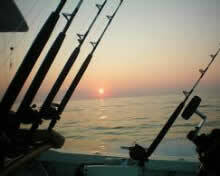 You can rent a charter to catch sea bass, marlin, mackerel and a multitude of other species. Or you can fish off one of our piers, right off the shoreline or take a small boat around the many inlets, creeks, and lakes around Myrtle Beach. Whatever your sport, a Myrtle Beach vacation at Barefoot Resort North Myrtle Beach will find you with very little time on your hands for thinking about anything but fun! Don’t miss this local festival! St. John’s Greek Orthodox Church of Myrtle Beach will hold its wildly popular 20th Annual Greek Festival from September 22-25. This 4-day event will be held in the fellowship hall and on the Church grounds on the corner of Hwy 17 By-pass and 33rd Avenue North, on Thursday from 11 AM to 9 PM, Friday and Saturday from 11 AM to 10 PM, and on Sunday from Noon until 7 PM. This festival features Greek music and dancers, arts and crafts vendors, and children’s activities. But the real star is the tasty, authentic Greek food – gyros, roasted lamb, Greek salad, spanikopita and countless Greek pastries and treats. Admission is $1 for adults, and children 10 and under free. Previous Previous post: Summer Blow Out Sale Extended!